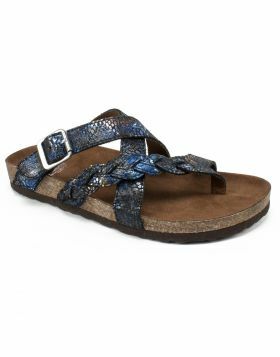 The multi color braided genuine leather upper of the Helena thong sandal by White Mountain shoes is a trendy update to the popular Hayleigh sandal. 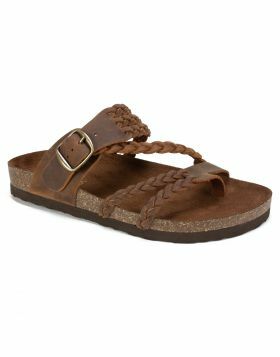 This slip on sandal features a molded suedette footbed, comfort heel cup and a traction outsole. The adjustable buckle allows for a custom fit. 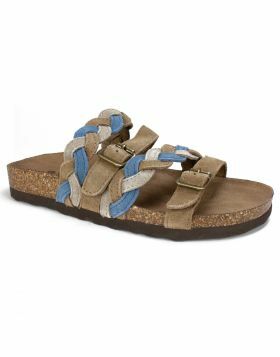 The multi color braided genuine leather upper of the Helena thong sandal by White Mountain shoes is a trendy update to the popular Hayleigh sandal. This slip on sandal features a molded suedette footbed, comfort heel cup and a traction outsole. The adjustable buckle allows for a custom fit. Heel height: 1 inch.